The Perks of Signing Up for My Paper Pumpkin with me! 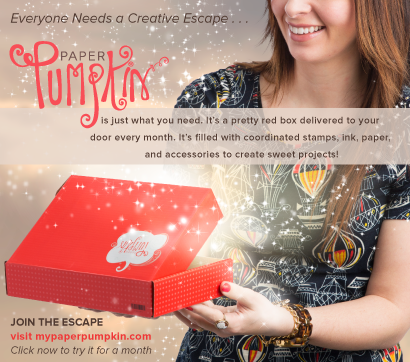 All New Subscribers get a Free Surprise Gift in their very first Paper Pumpkin Box! Get alternative Project ideas from me every month! I will have at least 1 blog post and/or video where I will show you how to stretch your Paper Pumpkin Kit and how to use it to create alternative projects. Get even more inspiration on my Pinterest Boards! Every month I create a new board for the newest Paper Pumpkin Kit where I pin many alternative projects for your kit! Subscribers can order Past Paper Pumpkin Kits and Kit Refills! In my online store there are lots of Past Paper Pumpkin Kits available only to My Paper Pumpkin Subscribers. So you can order the kits you missed, stock up on favorites or buy them as gifts! The kits make great gifts because everything you need is included right in the box! 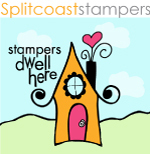 It is a great gift to introduce a friend to stamping! And the refill kits are an amazing value and a great way to stretch your kit even further! Sign up today for your Creative Escape!